Sometimes called the ‘Butterfly Bush’ Buddleja davidii is aptly named for its ability to attract butterflies and is indeed one of the best plants for attracting butterflies to the garden. 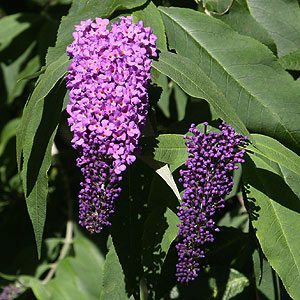 A summer flowering large shrub Buddleja davidii is a deciduous plant that grows well in a humus rich well drained soil, with masses of lilac flowers through summer this is an excellent plant for the rear of the garden border. Other uses include as a screening plant or informal hedge in a cottage garden. Buddleia have been popular with gardeners for many years, Buddleja are tough and easy to grow, nice foliage, lots of colourful flowers, evergreen or deciduous, sun to part shade in a well drained soil. Buddleja flowers come as spherical heads or drooping panicles, pink, lilac, purple, orange, and yellow. Summer flowering prune on a regular basis to maintain shape. Although the Butterfly Bush or Buddleja davidii is probably the best know of the species. Drought tolerant Buddleia plants are popular at the back of the garden border.. In terms of care this easy to grow plant from china requires a warm sunny position to perform well. Reaching around 3m with long arching canes B. davidii can be pruned back in late winter to spring to maintain size and shape. How hard can you prune, well start by removing old or diseased wood and then take the whole plant back to around 1m. Flowers appear on new growth so you should have lots of flowers the next summer. Remember to use clean secateurs and pruning saws to prevent disease. Try to prune on a regular basis so as not to have to prune into old wood which may have little chance of shooting. As with most plants a cool root run is beneficial, so mulch well in spring after watering well with a liquid seaweed fertiliser.